Warp back to 1978, and remember the Aurex System 15 by Toshiba. This was what the Japanese would call ‘epoch making’ – the first of its type, it was an incredibly small but exquisitely built ‘mini component’ system designed to perform as well – if not better – than its full sized rivals. It was an inspired creation, blending superb sound quality (for an all-in-one system), stunning ergonomics and ingenious design. The only problem was that it cost £1,000 – a lot of money now, but then it worked out at around four times the price of a Linn Sondek! Enter the Aiwa. Although not the first micro system, it was undoubtedly the first affordable one. It still cost and arm and a leg, still offered surprisingly fine sound, but at around £350 (still more than an LP12), was just about within reach of the spatially challenged audiophile. In doing so, it created the market for proper miniature hi-fis. Build is superb. We’re talking aluminium casings, big power transformers, heavy heaksinking on the power amp and a beautifully compacted cassette mechanism taken from one of Aiwa’s very well respected high end hi-fi cassette decks. It’s important to remember that in the seventies at least, Aiwa was a true high end brand famous for innovative and pioneering design – and stiff price tags. The cassette deck is a masterpiece of miniature engineering – beautifully put together, it features the bare minimum of facilities (Dolby NR, CrO2 switching, LED meters, tape counters) but does the job well. It’s stable, open sounding and the heads are good enough to run the likes of TDK SA tape into the red zone relentlessly. Only the clunky piano key controls let the side down. The tuner is another little gem – digital tuning display (although it isn’t a quartz synthesised tuner), switchable AFC and Hi-Blend and an impressively sweet and open sound on FM. Better still is its AM performance – most modern tuners don’t even come close. The original Aiwa microsystem won’t make you dump your modern system in the bin. It is, however, an interesting little bit of kit that – in one respect – is historically significant in hi-fi’s great scheme of things. A masterpiece of packaging, it put the writing on the wall for Japan’s mass-market manufacturers which had – until then – made ever larger and more imposing products. 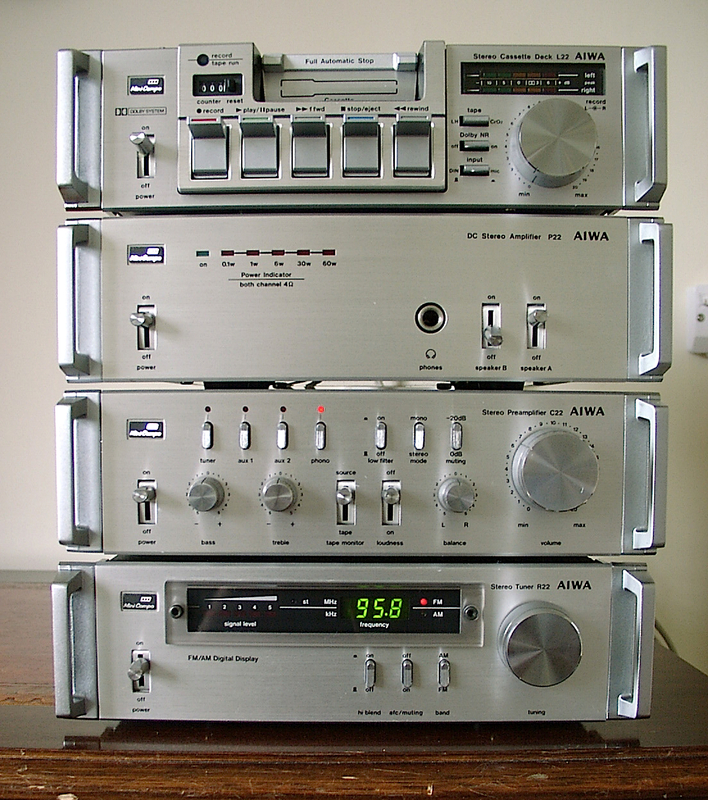 Today, you can pick up Aiwa microsystems for under £200 complete with the neat factory rack. If it’s music for your bedsit or bedroom you’re after, you could do a hell of a lot worse. En el año 1979,un amigo que viajo desde la ciudad de Iquique,hasta santiago de chile ,trajo este maravilloso y poderoso equipo, y me invito a su casa para escuchar..,y fue lo mejor que que habia escuchado para la epoca,un hermoso modelo ,por donde se le mire,impresionante el sonido y la potencia,para sus pequeñas cajas,sinceramente ,inolvidable.